Description: Opening hours: Monday - Friday 9:30 AM - 9:00 PM, Sunday 12:00 PM - 6:00 PM. 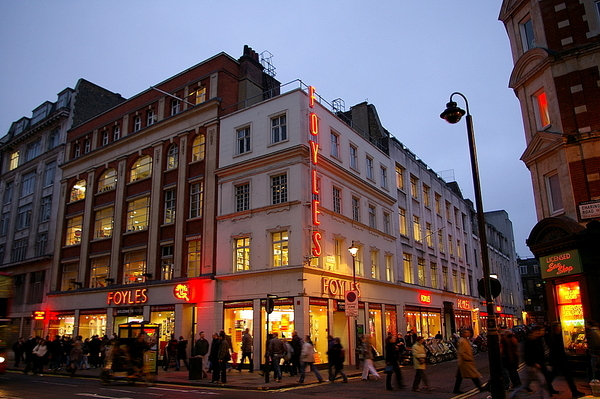 The original Foyles - not quite the old quirky days, when to buy a book involved queueing once for piece of paper and then paper in hand, again to pay, but still has just about every subject under the sun. Foyles are now branching out, including the ghastly store at Westfield shopping 'mall' in West London, but they are not a patch on this one. CLOSED AT 7PM ON 31 MAY 2014 TO MOVE TO 107 CHARING CROSS ROAD. NEW BOOKSHOP RECORD CREATED. Quite possibly the best bookshop in London. It's difficult to format the day-long multi author events and the week long gallery installations.